What Should Know about the Central Nervous System (CNS)? What Are the Different Parts of the CNS (Diagram)? 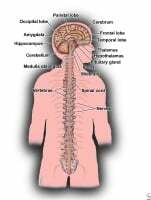 What is the central nervous system or CNS? What Is It's Function? The central nervous system consists of the brain and spinal cord. The brain plays a central role in the control of most bodily functions, including awareness, movements, sensations, thoughts, speech, and memory. Some reflex movements can occur via spinal cord pathways without the participation of brain structures. The spinal cord is connected to a section of the brain called the brainstem and runs through the spinal canal. Cranial nerves exit the brainstem. Nerve roots exit the spinal cord to both sides of the body. The spinal cord carries signals (messages) back and forth between the brain and the peripheral nerves. Cerebrospinal fluid surrounds the brain and the spinal cord and also circulates within the cavities (called ventricles) of the central nervous system. The leptomeninges surround the brain and the spinal cord. The cerebrospinal fluid circulates between 2 meningeal layers called the pia matter and the arachnoid (or pia-arachnoid membranes). The outer, thicker layer serves the role of a protective shield and is called the dura matter. The basic unit of the central nervous system is the neuron (nerve cell). Billions of neurons allow the different parts of the body to communicate with each other via the brain and the spinal cord. A fatty material called myelin coats nerve cells to insulate them and to allow nerves to communicate quickly. Picture of the central nervous system (CNS). The cerebrum is the largest part of the brain and controls voluntary actions, speech, senses, thought, and memory. The surface of the cerebral cortex has grooves or infoldings (called sulci), the largest of which are termed fissures. Some fissures separate lobes. The convolutions of the cortex give it a wormy appearance. Each convolution is delimited by two sulci and is also called a gyrus (gyri in plural). The cerebrum is divided into two halves, known as the right and left hemispheres. A mass of fibers called the corpus callosum links the hemispheres. The right hemisphere controls voluntary limb movements on the left side of the body, and the left hemisphere controls voluntary limb movements on the right side of the body. Almost every person has one dominant hemisphere. Each hemisphere is divided into four lobes, or areas, which are interconnected. The frontal lobes are located in the front of the brain and are responsible for voluntary movement and, via their connections with other lobes, participate in the execution of sequential tasks; speech output; organizational skills; and certain aspects of behavior, mood, and memory. The parietal lobes are located behind the frontal lobes and in front of the occipital lobes. They process sensory information such as temperature, pain, taste, and touch. In addition, the processing includes information about numbers, attentiveness to the position of one's body parts, the space around one's body, and one's relationship to this space. The temporal lobes are located on each side of the brain. They process memory and auditory (hearing) information and speech and language functions. The occipital lobes are located at the back of the brain. They receive and process visual information. Anatomy of the brain. Click to view larger image. The cortex, also called gray matter, is the most external layer of the brain and predominantly contains neuronal bodies (the part of the neurons where the DNA-containing cell nucleus is located). The gray matter participates actively in the storage and processing of information. An isolated clump of nerve cell bodies in the gray matter is termed a nucleus (to be differentiated from a cell nucleus). The cells in the gray matter extend their projections, called axons, to other areas of the brain. Fibers that leave the cortex to conduct impulses toward other areas are termed efferent fibers, and fibers that approach the cortex from other areas of the nervous system are termed afferent (nerves or pathways). Fibers that go from the motor cortex to the brainstem (for example, the pons) or the spinal cord receive a name that generally reflects the connections (that is, corticopontine tract for the former and corticospinal tract for the latter). Axons are surrounded in their course outside the gray matter by myelin, which has a glistening whitish appearance and thus gives rise to the term white matter. Cortical areas receive their names according to their general function or lobe name. If in charge of motor function, the area is called the motor cortex. If in charge of sensory function, the area is called a sensory or somesthetic cortex. The calcarine or visual cortex is located in the occipital lobe (also termed occipital cortex) and receives visual input. The auditory cortex, localized in the temporal lobe, processes sounds or verbal input. Knowledge of the anatomical projection of fibers of the different tracts and the relative representation of body regions in the cortex often enables doctors to correctly locate an injury and its relative size, sometimes with great precision. The central structures of the brain include the thalamus, hypothalamus, and pituitary gland. The hippocampus is located in the temporal lobe but participates in the processing of memory and emotions and is interconnected with central structures. Other structures are the basal ganglia, which are made up of gray matter and include the amygdala (localized in the temporal lobe), the caudate nucleus, and the lenticular nucleus (putamen and globus pallidus). Because the caudate and putamen are structurally similar, neuropathologists have coined for them the collective term striatum. The thalamus integrates and relays sensory information to the cortex of the parietal, temporal, and occipital lobes. The thalamus is located in the lower central part of the brain (that is, upper part of the brainstem) and is located medially to the basal ganglia. The brain hemispheres lie on the thalamus. Other roles of the thalamus include motor and memory control. The hypothalamus, located below the thalamus, regulates automatic functions such as appetite, thirst, and body temperature. It also secretes hormones that stimulate or suppress the release of hormones (for example, growth hormones) in the pituitary gland. The pituitary gland is located at the base of the brain. The pituitary gland produces hormones that control many functions of other endocrine glands. It regulates the production of many hormones that have a role in growth, metabolism, sexual response, fluid and mineral balance, and the stress response. The ventricles are cerebrospinal fluid-filled cavities in the interior of the cerebral hemispheres. Traditionally, the cerebellum has been known to control equilibrium and coordination and contributes to the generation of muscle tone. It has more recently become evident, however, that the cerebellum plays more diverse roles such as participating in some types of memory and exerting a complex influence on musical and mathematical skills. The brainstem connects the brain with the spinal cord. It includes the midbrain, the pons, and the medulla oblongata. It is a compact structure in which multiple pathways traverse from the brain to the spinal cord and vice versa. For instance, nerves that arise from cranial nerve nuclei are involved with eye movements and exit the brainstem at several levels. Damage to the brainstem can therefore affect a number of bodily functions. For instance, if the corticospinal tract is injured, a loss of motor function (paralysis) occurs, and it may be accompanied by other neurologic deficits, such as eye movement abnormalities, which are reflective of injury to cranial nerves or their pathways in the brainstem. The midbrain is located below the hypothalamus. Some cranial nerves that are also responsible for eye muscle control exit the midbrain. The pons serves as a bridge between the midbrain and the medulla oblongata. The pons also contains the nuclei and fibers of nerves that serve eye muscle control, facial muscle strength, and other functions. The medulla oblongata is the lowest part of the brainstem and is interconnected with the cervical spinal cord. The medulla oblongata also helps control involuntary actions, including vital processes, such as heart rate, blood pressure, and respiration, and it carries the corticospinal (that is, motor function) tract toward the spinal cord. Nerve fibers that exit the brainstem and spinal cord become part of the peripheral nervous system. Cranial nerves exit the brainstem and function as peripheral nervous system mediators of many functions, including eye movements, facial strength and sensation, hearing, and taste. The optic nerve is considered a cranial nerve but it is generally affected in a disease of the central nervous system known as multiple sclerosis, and, for this and other reasons, it is thought to represent an extension of the central nervous system apparatus that controls vision. In fact, doctors can diagnose inflammation of the head of the optic nerve by using an ophthalmoscope, as if the person's eyes were a window into the central nervous system. Nerve roots leave the spinal cord to the exit point between two vertebrae and are named according to the spinal cord segment from which they arise (a cervical eight nerve root arises from cervical spinal cord segment eight). Nerve roots are located anterior with relation to the cord if efferent (for example, carrying input toward limbs) or posterior if afferent (for example, to spinal cord). Fibers that carry motor input to limbs and fibers that bring sensory information from the limbs to the spinal cord grow together to form a mixed (motor and sensory) peripheral nerve. Some lumbar and all sacral nerve roots take a long route downward in the spinal canal before they exit in a bundle that resembles a horse's tail, hence its name, cauda equina. The spinal cord is also covered, like the brain, by the pia matter and the arachnoid membranes. The cerebrospinal fluid circulates around the pia and below the outer arachnoid, and this space is also termed the subarachnoid space. The roots of the cauda equina and the rootlets that make up the nerve roots from higher segments are bathed in cerebrospinal fluid. The dura surrounds the pia-arachnoid of the spinal cord, as it does for the brain. The neuroanatomical basis for multiple brain functions is oversimplified in the above summary. A good example is the neuroanatomical substrate for memory function. Damage to multiple areas of the brain can affect memory. These include structures such as the frontal and temporal lobes, the thalamus, the cerebellum, the putamen, mamillary bodies and fornix, and a convolution above the corpus callosum known as the cingulate gyrus. These structures are variably involved in complex processes such as the storing, processing, or retrieval of memories. The spinal cord is an extension of the brain and is surrounded by the vertebral bodies that form the spinal column (see Multimedia File 3). The central structures of the spinal cord are made up of gray matter (nerve cell bodies), and the external or surrounding tissues are made up of white matter. Eight cervical segments: These transmit signals from or to areas of the head, neck, shoulders, arms, and hands. Twelve thoracic segments: These transmit signals from or to part of the arms and the anterior and posterior chest and abdominal areas. Five lumbar segments: These transmit signals from or to the legs and feet and some pelvic organs. Five sacral segments: These transmit signals from or to the lower back and buttocks, pelvic organs and genital areas, and some areas in the legs and feet. A coccygeal remnant is located at the bottom of the spinal cord. Picture of the anatomy of the spine. Click to view larger image. is an autoimmune disorder that happens when your body's immune system attacks the covering (myelin sheath) that surrounds the nerves of the central nervous system (CNS). Doctors and researchers don't know exactly a person gets MS, but they believe it's related to genetics, acquired (you get it from an infection, etc. ), or from the environment. Chawla, J, MD, et al. "Central Nervous System Anatomy." Medscape. Updated: June 28, 2016.